randomization, etc., in your program with the help of colleagues of statistics and epidemiology. (In order for an OR project to be useful it is crucial to involve these colleagues from the initial planning stage, never afterwards.) After that, only the usual implementation is needed. You may just watch that the project proceeds as planned. When the project is terminated, the results are to be analyzed according to the plan. This process is greatly facilitated with the use of computer software such as EpiInfo. You should then discuss the analysis results deeply and thoroughly, in the light of the objectives, in order to reach a conclusion that in turn will be fed back to the planning of a new project of DOTS expansion. A proposal based on an OR project will be very powerful, practical and convincing. Powerful, because it comes from a well-designed project with scientific and logical arguments. Practical, because it depends on actual implementation in the field. Convincing, because it is based on the experiences that are shared by many related workers. Also, an OR project can be a very creative process. A new program based on the conclusion will lead to another OR project, and the results of OR projects can be generalized to create a new concept. An OR project is easy to implement. It just requires a bit of scientific sense that can be supported by external experts. All you have to do is to recognize its usefulness and to decide to do it, in order to enhance your NTP activities. The Research Institute of Tuberculosis is ready to work with you in planning and analyzing OR projects in your field and to assist you in building your capacity in OR. 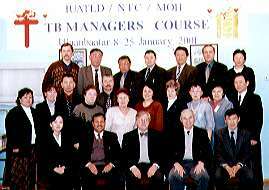 Sixteen managers from the Russian Federation attended a course organized by the National Tuberculosis Center, Mongolia, a Collaborating Centre of the IUATLD, and its director, Dr G. Tsogt (RIT Course graduate in 1992), in the Russian Language. They came from Moscow, Ekaterinburg, Novosibirsk, Irkutsk, Buryatia and Yakutsk. Facilitators came from the Mongolia National Tuberculosis Centre (Dr Oyuntsetseg, Dr Khandasuren Oteontuyaa, Dr Naranbat, Dr Buyankhisig), from IUATLD headquarters (Prof. Enarson), from the Research Institute of Tubercu1osis, Japan (Dr Mori), from the National Tuberculosis Centre of Nepal (Dr Bam, 1982, 1993) and from Liverpool, England (Dr P.D.O. Davies). The objective of the course was to provide an opportunity for exchange of views on tuberculosis control between colleagues from the Russian Federation and Mongolia. During the course, participants had opportunity to review bacteriological services, to visit treatment centers, to examine patient records and to speak with patients. In addition to discussions on the similarities and differences between tuberculosis services in the various locations represented, participants had opportunity to consider various options for continuing collaboration. Among these were the proposal for a follow-up workshop on sputum smear microscopy, on tuberculosis in children, as well as on provision of published materials in the Russian Language including `Management of Tuberculosis' and periodic issues of the International Journal of Tuberculosis and Lung Disease. In this column, the directors of NTP (among RIT alumni/alumnae) introduce their activities. Fatima Jinnah Chest Diseases and General Hospital, Quetta is one of the biggest specialized institutions of Pakistan, rendering services mainly to TB patients. It has the distinction of having a large number of clinicians, or pulmonologists, working for it. I was one of the several who adopted a career as a clinician at this reputable institute, after completing my post-graduate studies. I had another edge, being one of the very few bronchoscopists of the city because of my training in this particular field in the USA. Although the clinical practice proved to be financially beneficial, it failed to attract my attention to adhere strictly to it. The desire to work in the field of public health, particularly TB control, was always in the back of my mind. I knew what I wanted to do but did not know how to go about it. Then I got a chance to attend a long course in Tuberculosis Control and Epidemiology at the Research Institute of Tuberculosis (RIT), Kiyose, Japan. The course was sponsored by JICA. It turned out to be a wonderful learning experience. I have to admit that it provided solutions to many of my unanswered questions. I got a chance to learn from the top-most experts of the world. My fellow participants were also a source of great inspiration. Although the concept of DOTS was not in vogue then, the strategies to control TB were still very practical and effective. The course completed my transformation from a clinical to a public health professional. In addition to the academic sessions, the stay in Japan was very pleasant. We had the opportunity to visit many places in Japan, and learn firsthand how Japan was dealing with TB. I cannot forget Ito-san and his wife who worked round-the-clock to make us comfortable. On my return to Pakistan I knew what precisely was needed for TB control. Admittedly it was not easy, but with the help of my colleagues I managed to start a program in the province of Balochistan. Once the program became functional, we received a lot of encouragement from various quarters. I am now working as the manager of the National TB Control Program of Pakistan. We plan to implement DOTS all over Pakistan by the year 2005. I would like to take this opportunity to thank all of our friends, who have helped us during the years to make the program a success. And I hope that they will continue to support us wholeheartedly in the future as well. We deplore that: TB remains a global disease where 90% of all cases arise in low-income countries and over 95% of deaths from the disease occur there. TB afflicts 7 to 8 million people and kills about 2 million each year, including many children. TB is the most frequent cause of death in the world from a single agent in young adults. Out of the 22 countries that constitute 80% of the incident burden of TB in the world, ten are in the IUATLD Eastern Region. The twenty-two IUATLD-ER member countries account for about one-third of all reported TB cases in the world. Majority of affected men and women are in their most productive years between 15-54 years of age resulting to great economic loss. MDR-TB strains are threatening to overwhelm current faltering TB control programs among member countries. The conference covered quite wider areas of lung health from modern biomedical and therapeutic aspects, socio-economic aspects and prevention/public health of TB and non-TB lung diseases. RIT played a vital role in helping organize and lead discussions in various workshops and symposia, such as Drug-Resistance Surveillance, Quality Control/Assurance of AFB Microscopy and Symposium on TB in Urban Settings. Work shop on Drug-Resistance Surveillance, organized Dr. Sang Jae Kim of Korea, discussed problems in drug resistance among major countries in the region. Dr. C. Abe of RIT presented information regarding the currently increased trend of drug resistance in Japan. In the Symposium on TB in Urban Settings, organized and chaired by Dr. A. Shimouchi, in collaboration with WPRO/WHO, I made the introductory remarks. Dr.Fujiwara of IUATLD, using her experience in New York, pointed out some differences between urban areas in western and Asian countries.She said, " In urban areas in ER countries, TB is more commonly found among the elderly and indigenous population. However, in urban areas of western countries, TB is a greater problem among youths, foreigners, people with HIV or drug users". Other interesting topics were discussed in the workshops/symposia on DOTS expansion, Health Sector Reform and TB control, HIV/TB in Asia, Public Private Partnership, and TB Advocacy. The Eastern Region (ER) of IUATLD covers the largest area from Pakistan in the west to the Western Pacific Islands and New Zealand in the east. Nepal will host the 2003 conference, followed by Pakistan in 2005. More countries are encouraged to be members of ER-IUATLD, especially countries of Pacific Islands. The high quality of sputum smear microscopy is an essential component in DOTS strategy. It is being given greater importance and focus in management practice at the laboratory. A workshop on "Quality Control/Assurance for AFB Microscopy" was organized by RIT on March 6, attended by 74 people from various countries. Reports of QC/QA in the NTP laboratory were made by Mr. Huot (Cambodia), Ms. Soshila (Malaysia), Dr. Naranbat (Mongolia), Ms. Bacalso (the Philippines), Ms. Dhanida (Thailand), and Mr. Fawzi (Yeme). On the panel of reactors were Dr. John Ridderhof (CDC, USA), Dr. Shoichi Endo (RIT, Japan) and Dr. Pieter Van Mareen (WHO/WPRO). The session presided over by Dr. Cristina Giango (Philippines) focused upon the current practice of quality control, as well as its common problems and constraints in each participating country. Dr. Ridderhof, outlined the proposed external quality assessment (EQA) guidelines by WHO. He highlighted in his presentation that, when and where available, rechecking slides from the peripheral laboratory to the central laboratory is the preferred EQA method. In a rechecking method, random sampling and blind reading should be performed. Lot quality assurance sampling is recommended to determine sample size. Following the presentations, the participation shared active participation and reactions. Dr. Ridderhof, one of the members of the writing committee for WHO proposed EQA guidelines, stressed the need for effort among member countries to establish and sustain quality control program in their respective areas. It was assured that this would be given due consideration during the review and development of the final guidelines for an international external quality assessment for AFB microscopy. This workshop was unique, as it was the first one in the IUATLD Conference to include laboratory technologists and therefore must have given some inputs into the EQA guideline development by WHO. Many attendants desired that this kind of workshop should be conducted again. A Symposium on urban TB problems and related programmes was held on 7 March. Dr Ishikawa, RIT, introduced urban TB problems. Dr Ogawa, WHO/WPRO, analyzed problems from the aspect of healthy city programmes, placing more emphasis on environmental conditions. Situation analysis and current and future efforts were shared from urban cities in Asia: Osaka, Japan, Hong Kong, Cebu, Philippines, Bangkok, Thailand, Jakarta, Indonesia, and Chittagon, Bangladesh. A Common problem among all these cities is the high incidence rate of TB. Causes differed from the existence of homeless people (Osaka), a continuous influx of population from high prevalence areas (Hong Kong), and the existence of slum areas (Cebu). Common characteristics were that these cities have health infrastructure and rich health sources, yet coordination is very weak between government health centres and government and private hospitals and clinics. Therefore the main future effort for all cities is to focus on strengthening collaboration among all health facilities through strong leadership. A new model project has been launched in Myanmar since April 2001, jointly organized by the National Tuberculosis Control Programme (NTP), Myanmar and JATA. This 3-year project targets at six tow nships (about 100,000 pop. per township) in both Yangon and Mandaly, aiming at developing a model of DOTS implementation. Proposal for the original plan was based on the recommendation to set up DOTS model townships. This recommendation was adopted by the National Workshop in Yangon in October, 2000 in cooperation with RIT. A Memorandum of Understanding (MOU) was exchanged between Dr. Aye Thun, Manager of NTP and Dr. M. Aoki, President of JATA in Yangon, January 2001. In the Memorandum, JATA agreed to provide technical and financial support. This will be the third project organized by JATA, following those done in Nepal and Indonesia. Life at RIT was a most enjoyable and fruitful one. The lectures and practice helped me not only in polishing the usual procedures at my laboratory, but also in improving on them (Ms E. Reyes, Philippines). While at RIT, the magnitude of the global TB burden dawned on me. As a result, I pledged my commitment to help control TB in my country. I was also encouraged and impressed with the diversity of cultures and with the imaginary problems we were able to surmount during our stay together, as we learned to tolerate and appreciate each other. 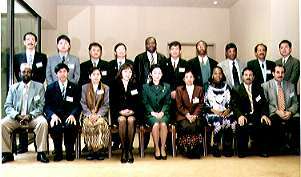 The opportunity given us and the environment created by the Japanese staff, made us valued representatives of our countries (Ms P. Caulley, Ghana). We are grateful to our teachers and to the staff at RIT for this opportunity. We hope to make use of the information, and to use it completely and successfully. We will always remember the Institute and our teachers (Mr K. Lay, Myanmar). I have conclude that Nepal's application of DOTS strategy since 1995 has helped patients to successfully and easily receive treatment so that the cure rate is now more than 85% and negative conversion more than 80% without microscopy (Mr R. Shrestha, Nepal). After 3 months and 20 days, we are now finishing our group training course. We learned many things through our lectures and practice. The DOTS Way! Ever heard of DOTS? No, it's not the acronym for "Directly Observed Treatment, Short Courses Strategy", the popular WHO teaser against tuberculosis. It stands for "Doctors Observing and Training Seriously - an Experience in Japan". And it is not simple work. Imagine participants coming from different countries in the thick of preparations on the first month of the year, and during the winter season, when most imaginative minds would tend to hibernate. It is a very difficult decision to enter into this kind of programme. But all the participants learned, participated and enjoyed. We found ourselves in the thick of lectures at the RIT. Additionally, we will never forget Ito-san, the man who was in charge of looking after us while we were at the dormitory. Life inside the RIT is something that every foreign participant should experience. It is synonymous to survival. One has to observe proper time management in attending the training sessions, cooking, doing laundry, marketing and of course, studying. I will always cherish the precious time spent on country reports, project cycle management, Dr. Laing's one week session, and the field trips to Hiroshima and Kyoto. I also will remember our times doing Action Planning. We learned a lot to become real managers, at least within the scope of our job descriptions and responsibilities. Seven weeks of stay in Japan seemed too short to explore our curiosity with regard to this well-developed country. As I take my first step away from this country and as I inscribe the last letter of this article, there I will begin to remember this fruitful and memorable stay in Japan. Though we may not meet again in the future, the memories will linger on. The Department of Applied Research consists of three divisions - epidemiological, data analytic and clinical. Despite these divisions, the subjects of study are not separated. The focus of the Department of Applied Research is the nationwide surveillance of tuberculosis in Japan. Data from local public health centers are collected and sent to RIT, which both analyzes and publishes comments on the data in addition to the actual data. Another larger area of study for our department is analyzing information form the mass screening for lung cancer throughout Japan. In the clinical division, we have focused on studying the effectiveness of a PZA-containing six-month regimen in addition to possible adverse reactions. Our study resulted in introducing a PZA-containing regimen as one of the standard regimens for tuberculosis in April, 1996. Another study in the clinical division has been the serological diagnosis of tuberculosis. Using these studies, a new diagnostic kit was developed and is now available in clinics. Staff members from the Applied Department also work in the International Cooperation Department. Mr. Fujio Ito, better known as "Ito-san", perhaps the most popular and impressive person among the ex-participants of the International Training Courses, retired this May from his job as housemaster of RIT's dormitory. Mr. and Mrs. Ito took care of participants' daily lives with zeal for 17 years. After leaving Kiyose they returned to Ito-san's hometown in Nagano Prefecture. When asked about his plans, Ito-san said "I'm going to do farm work there". We can't thank them enough for all their years of service with us! Five years ago, I moved from my position as Director of the Research Institute of Tuberculosis (RIT) to Chairman of the Board of Directors, Japan Anti-Tuberculosis Association (JATA). In March 2000, I then became president of JATA, following Dr. Shimao. JATA is one of the biggest TB Associations in the world, having Headquarters, the RIT, two hospitals and two dispensaries in Tokyo, as well as 47 Branches throughout the country. JATA has around 800 staff and employees in Tokyo, and more than 3,000 throughout Japan. JATA was originally founded in 1939 to promote domestic TB Control Programme. Today, JATA is not only involved in domestic, but also in international TB Control. It is additionally expanding its activities to the area of general health promotion. Unfortunately, the TB situation in Japan is one of the worst among all the developed countries. This means JATA is still very busy with domestic business. However, as Japan is one of the world's economically developed and experienced countries, we believe that JATA has to contribute increasingly to TB Control worldwide. Fortunately, JATA has been continuing its International Group Training Courses for nearly 40 years, and the total numbers of ex-participants from these international training courses now exceeds 1,400. I sincerely hope that JATA can contribute more and more toward worldwide TB control along with its many ex-participants in countries throughout the world. To Chief, Medical Doctors Training Div. To Project Development & Management Div. Online Newsletter from Kiyose is available. You can see color photos. When your contact address changes, please let us know.